GIVEAWAY!! 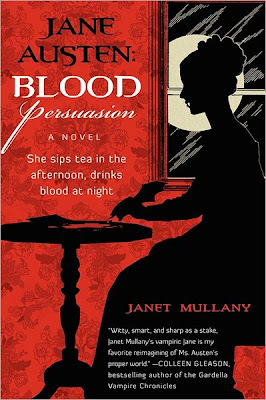 "Jane Austen:Blood Persuasion" by Janet Mullany ~ Loveable and Delectable! Prequel to "JA: Blood Persuasion"
a copy of her book! and follow/friend me on the sidebar! Summary of "Jane Austen: Blood Persuasion"
﻿It is 1810, and the Damned are out of favor—banished from polite society. Jane Austen’s old undead friends have become new neighbors, raising hell in her tranquil village just in time to interrupt Jane’s work on what will be her masterpiece. Suddenly Jane’s niece is flirting dangerously with vampires, and a formerly respectable spinster friend has discovered the forbidden joys of intimate congress with the Damned (and is borrowing Jane’s precious silk stockings for her assignations). Writing is simply impossible now, with murderous creatures prowling the village’s once-peaceful lanes. And with the return of her vampire characteristics, a civil war looming between factions of the Damned, and a former lover who intends to spend eternity blaming her for his broken heart, Jane is facing a very busy year indeed. The author of Jane and the Damned, Janet Mullany was reared in England on a diet of Jane Austen and Georgette Heyer and now lives near Washington, D.C. She has worked as an archaeologist, waitress, draftsperson, radio announcer, performing arts administrator, proof-reader, and bookseller. 1) First of all, please tell us a special something about what makes you "tick." When you aren’t writing, what are you doing? I read. I think it’s the most important thing a writer can do when not writing. I usually have something I’m reading on my kindle on the commute to the day job and something else I’m reading at night before I go to sleep. I also like music, particularly opera and baroque music although I don’t go to nearly as many live performances as I’d like. 2) You chose a specific genre, a place and time to write about, what made you choose it? Laziness. I thought I knew a lot about the Regency period, which in some respects I do, but for my Austen-vamp books I had to do a lot of research. 3) Please share with your readers where you like to write. Do you have a particular space or desk? What can you see from your desk? Do you have props you use to write from? What about special "charms? I have an office that faces south west and gets a lot of light. It is also warm in the winter and cool in the summer—in other words, it’s the best room in the house! I share it only with the cat. I can see what’s going on outside in the street and there’s a large oak tree outside. I think the only item that qualifies as a prop or charm, other than the cat who inspires by sleeping, is my kitchen timer, which I use when I really have trouble getting going. 4) In your opinion, what makes a book a great one? A book you can reread and find something new in every time. Like Austen! 5) Which author(s) most influenced your love of books from childhood? C.S. Lewis—as I grew older I recognized the Christian symbolism but it didn’t bother me particularly (see the next question), Kipling (ditto the jingoism, but he’s such a great wordsmith), Rosemary Sutcliff, Edith Nesbit. They’re all writers I’ve reread as an adult. 6) Read any good books in the past 6 months? "To End All Wars" by Adam Hochschild, which is about the first world war; "The Magician’s Book" by Laura Miller about C.S. Lewis, "The Mysterious Death of Miss Austen" by Lindsay Ashford, and a reread of "Sense & Sensibility." 7) Please share with us the underlying message of your book. What would you like your readers to take away after having read the book? I’m very uncomfortable about fiction having messages. If a reader learns an important life lesson from my books I don’t even want to know because that would make me feel under some sort of moral obligation for future works. I’m writing mass market fiction and the goal is to entertain. I hope I’ve done that as well as leave readers fainting away from the beauty of my prose and urging their friends and family to buy a copy or two. 8) Were you able to keep your original title? What was it, if not? Her charms of flesh and bone. Oh, that is so absolutely charming, Janet! It fits so well with your book. Perfect! 9) Is there a song or music in general that might best represent your book as a theme song? Not really. I listened to quite a lot of opera and Bach while I was writing it, and I find choral music excellent for love scenes. Not quite sure why. 10) If you could write your book again, what would you change? I would hate to have to write this book again! It was very hard to write. I think what I would do is spend more time in Chawton. There’s a lot of educated guesswork and peering at maps and I did visit Austen’s house and the Great House, but I should have spent a lot more time in the area. 11) What was the worst distraction you had to fight through while writing your book? My natural inclination to laziness and the siren call of the internet. 12) What did you feel or think when you held the first copy of your book in your hands? I find once I have the book in my hands the emotional connection isn’t really there. It’s become a product. It’s nice to touch the cover and to flip through and recognize what you wrote: at the same time it’s really the point of no return. I do, however, get very excited about seeing my books in libraries. That's very interesting, Janet. No one has said that about seeing their book in a library before! 13) Tell us a secret about your book we wouldn’t otherwise know, please! I think it’s one of the sexiest books I’ve written. There’s very little explicit material but a lot of yearning and desire. Thank you for bending to these busybody questions, Janet! It’s been a pleasure from my end of things! Janet Mullany's research is impeccable. But, more than that, she writes with such believability. Every scene is beautifully rendered; so much so that you can hear the china tea cups clink in Mrs. Austen's drawing room, and the see the crystal chandeliers gleam in the gothic ballroom of Fitzpatrick's house. I felt like swooning myself as she describes the dazzling vampire men. Who could resist them? I have such a weakness for dark and mysterious, dangerous men...especially vampires! Mullany knows how to create them, and she places them like gems in her Georgian vignettes. I love Jane Austen, but dress her up with a struggle over three main, gorgeous vampires of the "Damned" and I'm there for the asking every time! Anything Mullany writes should be a must read for those who love "mash ups" of Miss Austen. In this case, the book is so entertaining, engrossing from the start, including a beloved cast of characters that all Janeites will be familiar with. It's not possible to be anything other than delighted to be reading "Jane Austen: Blood Persuasion." I loved it, and tried to read it in one sitting. Would have accomplished that, if it hadn't been for a grandson who wanted to go swimming all day! 5 stars for this brilliantly vampirish Jane! Thanks for the great review, Deb! I am DYING to read this book! Great review! Janet, JABP sounds fantastic. I'm also trying to win it in Night Owl Romances. This is a very cool blog and I would have followed even if you hadn't asked me too. I look forward to more visits. Thanks! 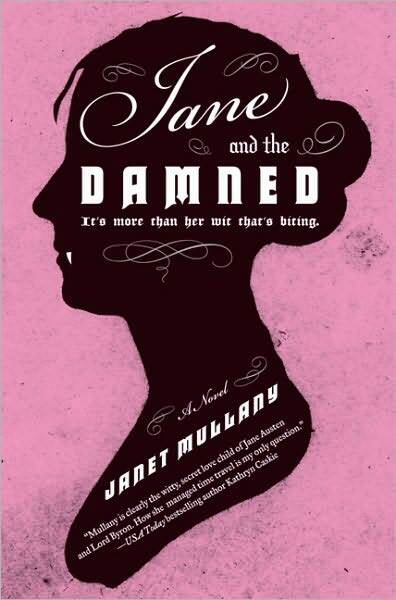 I loved Jane and the Damned so can't wait to read this! Thank you for an interesting interview and the review. I have not yet read any of the mash-ups, but am intrigued by them. I know some people are upset that anyone would have the nerve to mess with Jane and her works. They need to see if their sense of humor is still alive and well. Jane had one and I think she would be intrigued and amused by what is being written. Another cool twist on a classic novelist. Hope I win! Just wondering, is it possible to read JABP before JATD and still enjoy it? Or preferably JATD should be read first? I love how the author's personality come through when their answering interview questions. Janet sounds just like the voice in her books that I've read. I have not read this second Jane Austen Vampire book yet so would love the chance to win it. Thanks for the interview and giveaway opportunity. I was wondering the same thing as Luthien84, can you read Jane Austen: Blood Persuasion without reading the prequel? This book sounds like it would fit nicely in the JA Spinoff Challenge I'm doing this year!